..Aandaal… the goddess who rules the Supreme Lord …. …..
Srivilliputtur beautiful village turned ” town” houses two famous temples- Lord Vatapatrasayee kovil ( sri vaishnava divyadesa kovil) and Andal kovil(Godadevi’s residence). Located in Virudhunagar District about 75 kms away from Madurai from north and about 70kms away from Tirunelveli from south ,this temple is famous for Mother Andals appearance. The Rajagopuram of the temple has eleven tiers and 192″ height being one among the tallest towers of temples in the state. The Tamilnadu Government’s official symbol remains to be this gopuram . This holy place is worshiped as Varaha kshetram. Bhrigu and Markandeya maharishis were performing penance at this holy place . The demon Kalanemi was troubling them causing hindrances in their daily rituals . Lord eliminated the demon Kalanemi using Sudarshana Chakram. The sudarshana chakra cleansed its blood stains by taking a dip in this holy tank located inside the temple in which the rivers Ganga , Yamuna and Saraswathi reside . Hence, this temple tank is called as Thirumukkulam tank. Over a period of time this place got covered by sand dumes and then huge vegetation erupted all over . After a long period of time this holy place got converted into a dense forest . Due to the passing time , the deity also got submerged in the soil. Later, Villi a hunter came in search of his brother happened to take rest under a banyan tree. He heard an asareeri ( divine voice ) saying Lord is lying down under the same banyan tree. He was instructed to clear the woods and build a temple for the Lord. Villi rushed to the King and thus , with the help of Pandyan king, cleared the place, took out the deity , built a temple and town. Hence, the place got the name Villiputtur. Sri was prefixed to the name after Andal ( Godha) appeared at this place . The divine pastime is to be cherished on this auspicious appearance day of our divine mother Andal . Vishnu chittar,( Peria Azhwar ) an amsam of Garudazhwan, was performing pushpa kainkaryam to the Lord in this place. Azhwar was offering morning ablutions and after watering the flowers and the Thulasi plants plucking the blossoms and Thiruttulai dalams was moving ahead towards the temple . 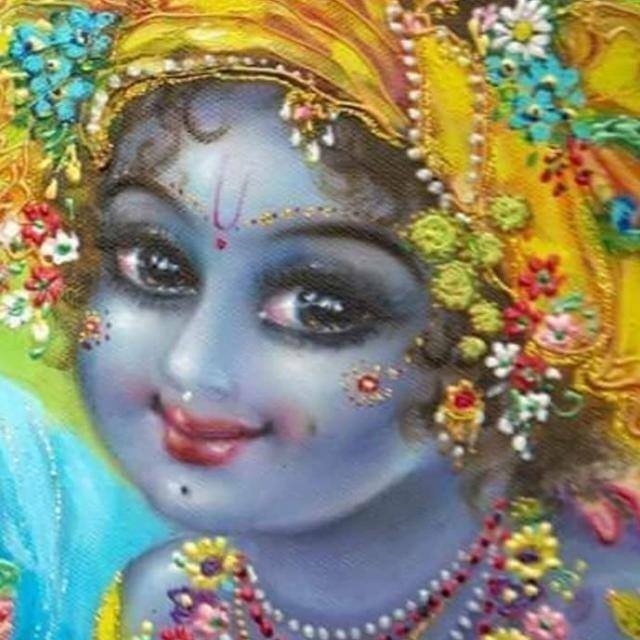 He suddenly espied at the foot of a cluster of Tulasee plant a little baby girl moon faced with curly hairs and the smile resembled the fine gentle flutter of petals of a golden lotus . Peria azhwar was wonder stuck with the divine play .It was a feast for his eyes looking at the abundant merciful eyes of the baby girl .He accepted her as his daughter as per the divine will and took her home .The girl displayed extraordinary features of divine beauty and love for Azhwar . Azhwar brought her up with utmost care and affection . THE GIRL WHO EMANATED FROM EARTH . Godha displayed divine qualities .She was alike the moon and her presence was an object of decoration for the Tulasee garden and she appeared as an incarnation of beauty , wisdom and piety . Right from her childhood Godha temperaments and attitude were different from those of the children of her age . She appeared a philosophical genius of saintly nature almost like a girl saint always contemplating about Lord and the divine pastimes .Always immersed in Krishna katha , she helped her father in watering the flowering plants in the garden .She used to follow her father like a shadow in all the divine services , preparing garlands for the Lord , worshiping and offering prayers . She was always found muttering LORD’s holy names and became an angel in the lives of Azhwar and disciples . She was seen in gentle smiles of understanding and appreciation and sat like a saint in penance always in the mood of Krishna . One evening Azhwar went into the garden to pluck the flowers when they were about to bloom . Each flower had a specific time when they used to bloom . He collected all those flowers meticulously so that the fragrance is enjoyed by the SUPREME LORD .After preparing a garland of fragrant flowers along with Tulasee he hung the garland on a wooden peg across a wooden pillar within the ashram . He had to go to the temple after sunset and hence he took a stroll . One day ,when he returned , he saw Godhadevi having worn the fresh garland, who was looking into the mirror imagining Lord Krishna’s presence . What is this you have done ? How could you choose to adorn the garland that was made for the Lord ? This garland has now become impure and unfit to be offered it to Supreme Lord .. It is already late and no time left to pluck the fresh flowers and prepare a new garland for Lords service. The time for temple worship has already begun . My child I will be committing an offense today without adorning HIM with a fresh garland………………. Godha was cool and gentle .She never spoke a single word ..
After offering services to Lord Azhwar came back to Ashram and was upset for chiding Godha . He did not sleep . He recounted those days of service and pleaded forgivness to Lord . Somehow he was filled with remorse and he woke up early to meet his daughter . But he could not find her inside . Godha was already there playing with someone in the garden . Azhwar stood behind a tree and was watching patiently . ..Not there ..Here . I found you …..and laughing …in ecstasy she ran and calling Krishna’s names ..
Azhwar quickly realised Lord was really playing with her .He was in a fix . He submitted with reverence Oh Lord ! Godhais my daughter that providence showered on me . Its your divine play .Please accept her garland as she is always in your thoughts . Time passed . Both father and daughter were together in all the divine services .Godha was nourished with Lord’s kalyana gunas . Godha was now 12 years . She acquired erudition and scholarship in Tamil and Sanskrit . All the thoughts focused on Lord Krishna . She desired Lord to be her husband ……………………..
Mentally fixed in Lord’s anubhavas she was transcendental soul . One day Azhwar leisurely asked ..
My dear Child ..Godha .. But my dear ..Tell me !! How did this thought arrive ? and Azhwar could not question her decision even if it was childish . LORD KRISHNA is omnipresent and tell me how can you marry Lord in Nirakara roopam ? Godha smiled and said …Father !! I wish to marry Archavataram which is there signifying the Omnipresent Lord ..
there are 108 Archavataram of Lord in Divyadesams ? Godha was quick to respond without any hesitation . She learnt about the Kaathyayini nombu observed by the Gopikas of Vrindavan during Margasira month (Dec-Jan)…. and nurtured a desire to do similar nombu to attain Lord Krishna. She imagined herself and her friends to be gopikas in Vrindavan, observed nombu in Margasira month by personally inviting her friends to participate in worshipping the Lord . she says “vaayinaal paadi, manathinaal sindhithu….. by doing so, our sins get burnt like a cotton which falls in fire. This is the tamil translation of Lord Varaha murthy’s advise to Bhudevi—kirtanam, smaranam,, vandanam etc. Mentioned earlier in the post. She proceeded in her divine outpourings on the Lord further which is known as “Nachiyar Thirumozhi” comprising of 143 pasurams invoking the Lord at Thiruvenkatam, Thirumaliruncholai , Vrindavanam etc. Nachiyar Thirumozhi expresses the pangs of separation from the lover. Our poorvacharyars comment that we get golden ornament only when it is put in fire. Likewise, the Lord out of HIS compassion on us, restrained from giving darshan as HE preferred to listen to HER hankerings for HIM. During abhishekam to Lord Srinivasa in Tirumala when the Thayar from the Lord’s vakshasthalam( chest ) is removed for a while , Swamy Ramanujar instructed Nachiyar Thirumozhi to be recited. Her bhakti was unparalled which made Lord Ranganatha of Srirangam to appear in Periazhwar’s dream. Lord ordered him to bring Andal dressed as a bride to Srirangam where HE would marry HER. Azhwar was keen to undertake her wish . He thought as per Lord and Godha’s wish , he would ask her to dress in a brides attire and proceed to Srirangam .There she would stand before the LORD and in adoration worship and pray .That micht surely afford her satisfaction to her fancy . He had already seen Periazhar devotion to Lord . The Royal couple reached the Ashram of Azhwar and pleaded Azhwar to handover all the responsibilities of conducting the divine marriage by them . During the discussions ,the chief Priest of Srirangam temple arrived at Azhwars ashram and informed Lords eagerness to meet Godha .Periaazhwar was overjoyed and thanked all of them for their concern. The Chief Priest offered the silk clothes and ornaments of Mahalakshmi to Godha . Godha was now dressed like a bride . Godha was perfect bride for our LORD of LORDS our RANGANATHAR ..
She sat inside the palanquin arranged by the royal couple. The august assembly had famous musicians , vedic pundits , dancers and several artistes . The procession began with pomp and show the entire pathway was colorful with flower decorations .With musical bands ahead followed by Royal couple , the vedic priests , PeriaAzhwar along with his disciples the men , women and the children followed the palanquin . Fireworks all over , the celebration was unique and the entire population followed the palanquin .. The procession reached the Srirangam temple entrance . She came near the main temple … And …kept walking briskly with her anklets jingling in the background .. The temple sanctum sanctorium where only the priest enters arrived ..
LORD who was also eager to meet Godha had a bewitching smile ……………………..
She stepped in ..and reached seshapanpu ( fourteen folds of Adhishesha ) walked over the folds of Adhishesha and reached the lotus feet twain of Lord and sat at HIS lotus feet .She touched those wonderful sacred feet with her tiny beautiful tender hands and dissolved in HIM once for all …. Periaazhwar was watching .He was speechless . Standing motionless with tears and grief he went near the sanctum and with a quivering body and lips shivering , expressed in broken words ..
A pin drop silence for few minutes prevailed ………………………. A divine voice was heard by Periaazhwar asking him to be composed as the entire divine play was enacted by Lord for our upliftment …. It may be noted , Andal is given more preference than Ubhaya nachiyars in our temples. In Srirangam, Namperumal’s garlands are offered to Ranganachiyar on Panguni Uthiram, with Kamalavalli nachiyar on Panguni Ayilyam, with Cherakulavalli Nachiyar on Maasi Punarvasu but Namperumal doesn’t accept their garlands! It is only one sided whereas Namperumal exchanges garlands with Andal. First Andal’s garlands are worn by Perumal and then Perumal’s garlands are offered to Andal. 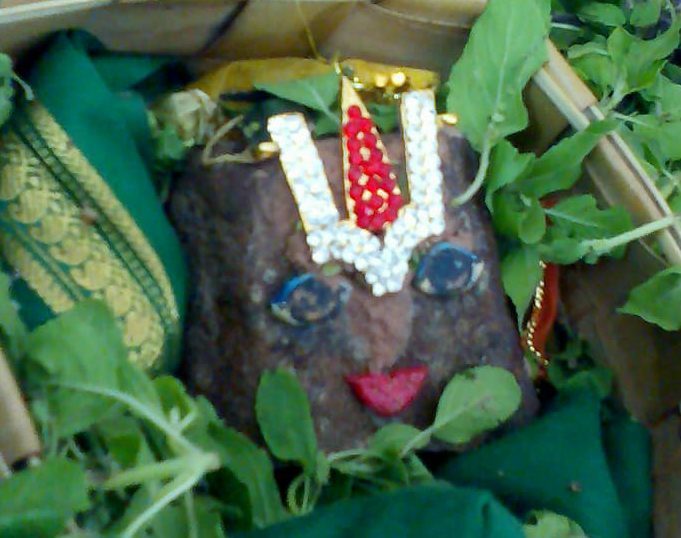 In Tirupati, Swamy Ramanujar arranged Andal as Lord Govindaraja Swamy’s consort. In Tirumala during Brahmotsavam, on Garuda vahana utsavam day , garland from Srivilliputtur is offered to Malayappa Swamy. This custom is followed in almost in all the divya desams. Last but not the least, in Srivilliputtur, the garland worn by Andal on the previous day is taken out in a procession on the next day to Sri Vatapatrasayee temple and is decorated to the Lord. Thiruaadipooram is the most important festival celebrated in Srivilliputtur lasting for 10 days. After several years , She left Her sanctum (Garbha graham ) and rushed to welcome Jagath Acharyar Swamy Ramanuja as Her elder brother for fulfilling Her pledge to offer 1000 vessels of akkAra-adisil to Lord SundararAjan of ThirumAlirum ChOlai. After that reception to AchArya RaamunjA , the ThiruppAvai Jeeyar , She never went inside Her sanctum and stays even today at the ardha manTapam . and later for Swami Desikan times She engineered to arrive in front of the house outside Her Thiru MaaLikai Veedhi , where Her parama bhakthan was staying during his visit to Her city. Moved by that extraordinary display of Vaathsalyam and daya of Mother ANDAL , the LOka MaathA , our Kavi Simham poured forth in rapture his eulogy of Her anantha KalyANa guNams .Thus originated the GodhA sthuthi and its 29 slOkams . Neeratam festival during the last six days of Margazhi ( Dec- Jan ) month attracts millions of devotees ..
Next postSwamy Ramanuja’s replied . ….My child !! When Vibhishana was allowed to approach Lord Rama , no separate invitation was needed for the four attendants who accompanied him..
Nice. Just a word on the use of pictures. You have used my pictures on Tiruppavai without permission or a word of acknowledgement. Pl do. Thank you. Godha got down and paced towards the sanctum quickly as if she was so familiar . She walked straight into the sanctum sanctorium after crossing Garuda mantapam… She came near the main temple … And …kept walking briskly with her anklets jingling in the background .. The temple sanctum sanctorium where only the priest enters arrived ..
LORD who was also eager to meet Godha had a bewitching smile ………………She stepped in ..and reached seshapanpu ( fourteen folds of Adhishesha ) walked over the folds of Adhishesha and reached the lotus feet twain of Lord and sat at HIS lotus feet .She touched those wonderful sacred feet with her tiny beautiful tender hands and dissolved in HIM once for all …. ANDAL is my attraction since 4years old! Adiyen chewed every Tiruppavai without understanding the meaning since 5years old! Only now I enjoy the same as Prabhandam, attending classes. Awaiting the day to visit Srivilliputhur for Tiruadippuram! Enjoyed Padmini’s dance – Varanamayiram! Varadan, do your daughters dance? Dress them as Andal & enjoy the Bliss like Periyalwar! – Ramanuja Dasan – Jai Sriman Narayana!